A little crowd had gathered and was peering into the stormy looking water. The weather had changed, and there was a cool wind blowing off the Messenian Gulf. It was hard to spot the turtle between the dark ripples, and I missed a couple of chances to take a photo as it popped its snout above water. Then a silly young Frenchman decided he wanted to swim with it, jumped in and scared it away. ‘Merde’, said his girlfriend. Merde, indeed. So here is my best shot. Little more than a peek. But then it is good to know that there are still loggerhead turtles around the Peloponnese. One of their breeding beaches is at Koroni on the far side of the castle. Every year between June and mid-September the turtles make some 46 nests there. These are monitored throughout the summer by ARCHELON, The Sea Turtle Protection Society of Greece, along with a host of volunteers from around the world. Good on them, I say, and bon voyage last loggerhead of summer. You can find out more about Archelon, The Sea Turtle Protection Society of Greece HERE. 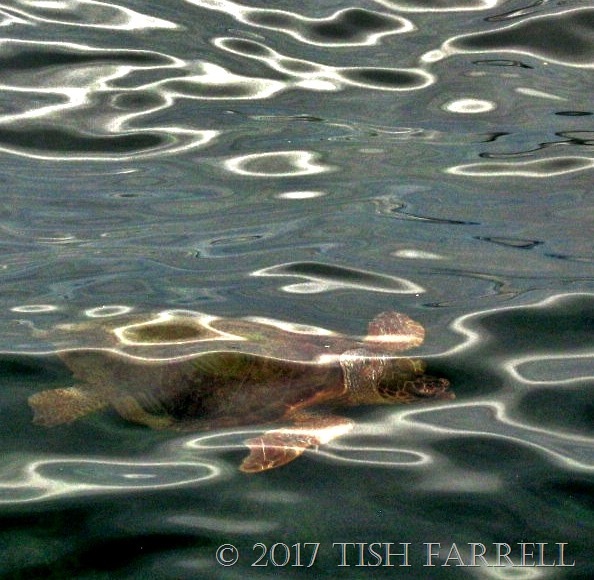 Posted on November 1, 2017 November 1, 2017 by Tish Farrell	This entry was posted in Photo Challenge, Travel and tagged #PerouliaDreaming, Archelon, DP weekly photo challenge, Koroni, Peloponnese, Tish Farrell Writer, turtle. Bookmark the permalink. Fascinating, Tish, and I like the shot. It’s different to see the turtle under that water. It’s a great shot, despite idiot Frenchmen. But, ever trivial, I want to know what flavoured ice cream! Well I went traditional and had vanilla which was wonderful, but there were all sorts of other combos involving caramel, almonds, pistachios, chocolate, and all the fruity flavours. Pistachio please, or fig and almond. 🙂 🙂 So glad you managed a peek, Tish. Now I’m conflicted. I missed the moment. I hadn’t thought of the fig option, though I’m sure it was there. Am a complete convert to Greek figs. The waiter said ‘it’s a big one’ so it seems it was unusual both size- and time-wise. Oh, sad tales of ice cream disasters. I once had a Labrador, to whom I gave the tail end of an ice cream cone, and while she was adjusting it in her mouth she dropped it down a drain. Oh the look of loss and mortification. I should also say we did do our fair share of dribbling. I know how she felt! In spite of the stupid guy you got an excellent pic…. The water reflections are amazing! A good photo 🙂 where do the turtles go ? I think they go off into the wider ocean outside the breeding season. Thanks, Amy. It was a thrilling moment. I once spent a lot of hours trying desperately to convince some islanders to not eat that turtle. I was unsuccessful. Sometimes, you lose the battle. I’m glad there are still some turtles swimming the seas. Oh how lovely to see a turtle!